I’m just diving in to this newly released book and am already intrigued. Who can even fathom work without email? It may become a thing of the past, according to author Scott Belkum. 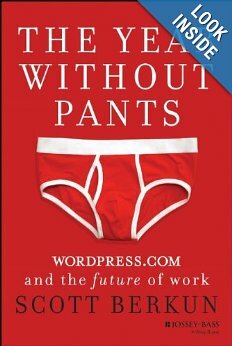 This book offers a behind-the-scenes look at the firm behind WordPress.com and the unique work culture that contributes to its success. Stay tuned for my reactions! Jason Levin (MBA’06) recommended Daniel Pink’s book, To Sell Is Human, after a branding workshop we did with him. It’s a fascinating book in which Pink offers a glimpse into the new science of sales (long gone are the days of door-to-door selling) and offers the new best practices for moving others. Pink explains that everyone works in sales; he even commissioned a study that shows that people spend about 40 percent of their work time persuading people. No matter your industry, it’s a fantastic and very useful read! I am in the middle of reading Susan Cain’s New York Times bestseller, Quiet: The Power of Introverts in a World That Can’t Stop Talking, and find it fascinating. As an extrovert, I thought it would be wise for me to read this book and gain a perspective on how “the other half lives.” So far it’s been eye opening to not only hear Cain compare the decision-making styles and behaviors between the two traits, but show how the United States transformed in to a country that promotes extroversion in every facet of society – especially the workplace! I’m excited to continue reading Cain’s analysis on how adopting introverted traits may not be the worst thing for our current and future leaders. We want to know: what books are on your reading list?